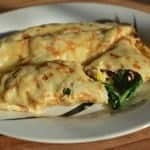 This recipe is an original to The Usual Saucepans, as it was made up after looking at a picture of a spinach-filled crêpe online. You can play around with any of the flavours involved or simply use the crêpe/pancake recipe on it’s own to make your own treats. You can use any cheese you like, but I opted for gruyère as it melts really well. It makes enough crêpes for about 4 people. To start of with make the batter for your pancakes. To do this measure the flour and salt into a medium sized bowl, then pour in about a quarter of the milk. Using a whisk, combine the mixture until it forms a paste – you should whip out all the lumps, otherwise your pancakes will not cook evenly. Once smooth whisk in the eggs and then the rest of the milk. NOTE: if you want to make spiced or herb-y pancakes add in 1 tsp of your spice/herbs here. Put a large flat frying pan on the hob on a medium heat and add your butter to it. When the butter melts swirl it around the bottom of the pan so that it’s entirely covered. Do each crêpe individually by pouring about 50 ml of batter into the pan (2 tbsp). Roll the pan slightly so the batter spreads across the bottom of the pan. Let it cook for about 20 seconds (it will vary hugely between the heat of the pan and thickness of the batter), until air bubbles appear all over the top and the edges brown, toss your crêpe to flip it over – or use a fish slice if you don’t feel brave – and then cook the other side for about 20 seconds. Remove from the pan and place on a flat dinner plate, gently folding it into quarters. Repeat this process until all batter is used. As the pan gets hotter the process will get quicker and quicker. If your pan drys out (the cooked crêpes will start to stick) add a little more butter before the next crêpe. Once you have all your crêpes ready do your filling. Thinly chop your leek – I quartered mine, then sliced across to give me quarter circles (no one wants a big chunk of leek in a crêpe) – and soften it in a pan with a bit of butter (the more health conscious can use an oil, but it is a day of excess after all). Grate all of your cheese and slice the ham. Wash the spinach gently. When the leeks are soft, add in the spinach and let it wilt. When it’s halfway there chuck in the ham and two-thirds of the cheese. Ensure it’s all evenly distributed. Once the filling is ready, take a crêpe and add a spoonful or two of filling, then roll like you would an enchilada. Place it in an oven proof dish then repeat the process, lining up the enchilada-style crêpes beside each other. When the dish is full/you’ve no more crêpes, cover the top with your remaining cheese and put under the grill for 6-8 minutes until warmed through. Serve immediately.